I admit I teared up while watching this. As a parent of a little boy with Down syndrome I can only imagine how proud and happy Rion’s parents are for there boy! I also love the sense of pride in Rion’s voice as he read the letter. So awesome! I don’t know you Rion, but I’m proud of you! There’s never been a better time in the history of the world to be born with Down syndrome! 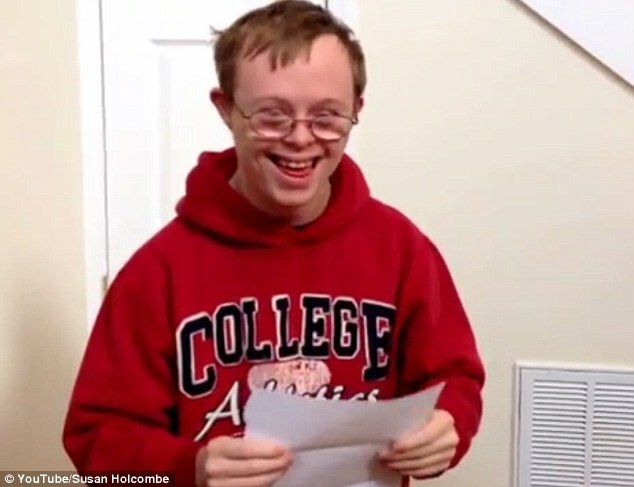 People with Down syndrome are going to college, getting married, modeling, getting their driver’s license, changing the world, and accomplishing amazing milestones every day!! I’m so proud to be Noah’s daddy, and love having a front row seat to what God is doing in His life every day. How great this is! It is so nice to know that perceptions are changing and that our little ones will have opportunities that were once not possible. I am still crying with joy for Rion and his family! I wish every special ed director in every school in the country could see this! Way to go Rion!! Absolutely! I would love to see more programs , scholarships and education opportunities for children with DS or any other learning disabilities. A college degree is so important in order to crossover to adulthood. I dream of my child achieving this important milestone someday and I will do everything in my power to make it happen. I am already saving for it 😉 he is 1 year and 4 months ! It’s o nice to see them excepted in things and schools. I know some people with Down’s and they’re a joy to be around. I heard one time we’ll all on the same river but, in a different boat. I have CP but we all human and servants of the same King. My son, Noah talks about going to college all the time. He hears older siblings & cousins talk about college so why can’t he go to college? We look forward to the day he goes! My daughter Melena has DS, she wants to go to college, model, be an actress. When she was in her twenties these opportunities were not available to her. She’s forty two and still dreams of having what everyone else has, independence and the chance of a life doing what she loves doing. I hope and pray all colleges make the effort to have similar programs like Clemson.